How do I become a Marist? It takes some time for you to get to know us and for us to get to know you. What are we looking for in a candidate? A sensible mature man, there is a cutoff at 35, who has successfully completed high school and qualified for university. You need to be in good physical health and free from chemical and alcohol dependency. You need to be a person who prays regularly and attends mass with some participation in church life. As well you need to be in regular contact with a Marist in your own country. After that initial period of discernment a formal application is made. The application includes an English test and a psychological assessment. As well you need to supply a copy of your baptism and confirmation certificates, education records and some personal references. Applications need to be submitted by the 1st May each year. That application is then considered by the Provincial and his Council. If your application is successful you will enter our house of formation at Marist College Suva Fiji in August. it take? Formation for Marist priests normally takes at least eight years. Each year there are activities and experiences designed to help the seminarian to continue his discernment. There are six years of academic study at the Pacific Regional Seminary in Suva. Marist Mission Experience: Pastoral experience for one or two years in a Marist community. 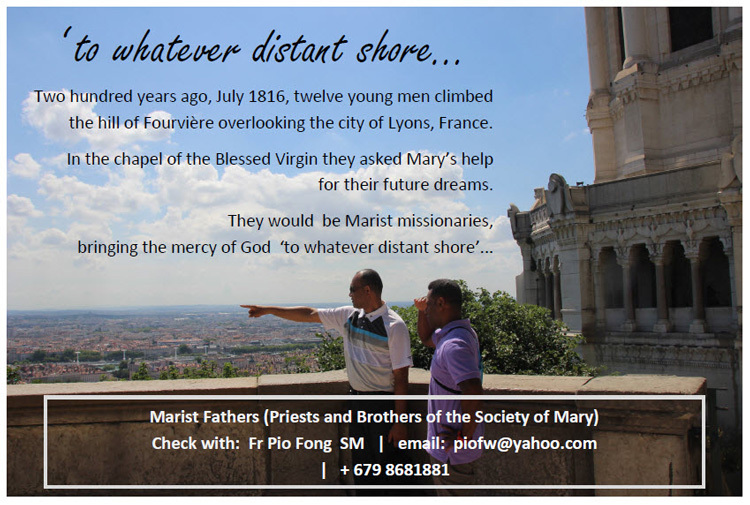 Normally, a young man interested in Marist life would be in contact with one of the Marists in the country from which he came. Process and entry 1. Complete the required entry application forms. 3. Complete the required psychological tests. 4. Complete English tests where needed. This information is then reviewed by the provincial and council and a decision is made to either propose this person for seminary studies, for brothers’ training (when requested) or not to accept the person. All applications are to be with the provincial by September 1st, prior to the year of entry. Notification of acceptance is usually provided by November.